I took this photo down by the lake today at work. I thought it was a red-spotted purple at first but when I looked closer at the photo there seems to be a few things different than usual. The red seems to be in the wrong place on the top of the wing. A classic red-spotted purple should have those red dots up on the edge of the fore wing not the hind wing. The under wing seems too black and lacks the red spots typical of this species. A lot of the other details are correct though. the two larger white spots on the tip of the fore wing, the white tips leading to two light blue dots then a light blue crescent then black then light blue turning to purple...all of these things are correct but those darn reddish spots! The red-spotted purple IS supposed to have red dots exactly where they appear on this butterfly but they are supposed to be on the underside of the wing, not the top. I vaguely recalled that red-spotted purples hybridize with white admirals, maybe this was a hybrid? I decided to investigate. 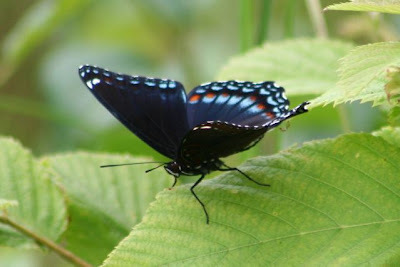 Here's a link to a butterfly someone is calling a red-spotted purple and a white admiral hybrid. Looks pretty similar. You can just see some light red spots on the hind wing. But, here's a photo of a butterfly someone in Wisconsin is calling a red-spotted purple and it looks exactly like the one in my photo. The red dots on the hind wing are exactly like those of a white admiral and this butterfly looks like a combination of a white admiral and a red-spotted purple. As it turns out there is a lot of confusion over these butterflies. Because red-spotted purple and white admiral butterflies freely interbreed, some scientists have decided that they are in fact the same species. This gets into the sticky debate of "What is a species?" In 2001, the white admiral and red-spotted purple were re-classified as subspecies of the newly created species red-spotted admiral. So, I can safely say this is a red-spotted admiral. Check out this wonderful page of photos to see the variation in this species. Scroll down and the first few photos look just like mine. So, this is one of many variations of red-spotted admiral butterfly created by interbreeding of the two sub-species, red-spotted purple and white admiral.